The crew of the Moana welcomes you aboard this beautiful sailing ship. On this unforgettable cruise, specially designed for divers, you will experience an unimaginably beautiful journey. You can dive 4 times a day at beautiful locations! 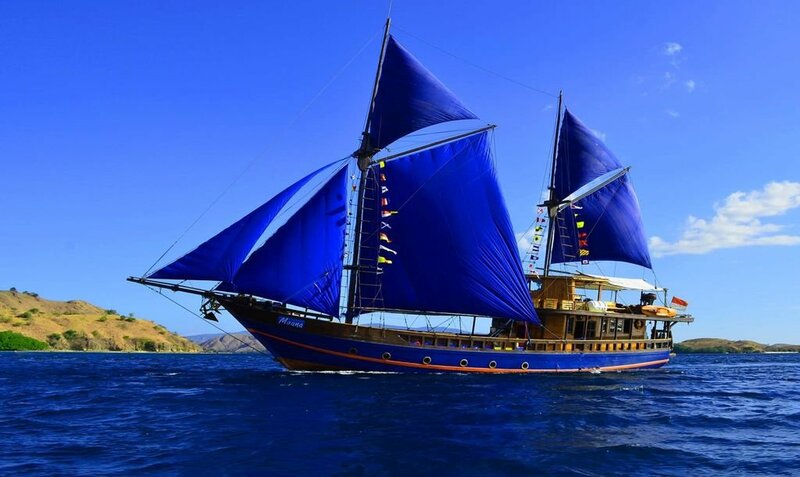 MOANA is a custom built Indonesian Liveaboard Ship. 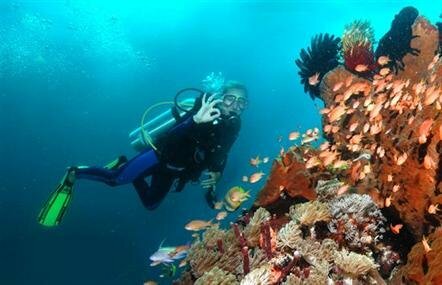 She is perfectly equipped to suit divers to see the best of the KOMODO NATIONAL PARK as well as genuinely unknown and pristine divesites. Since 2004 MOANA offers dive safaris and thanks to many happy passengers we have established an excellent reputation. We are one of the few Komodo based ships operating from March till December only in Komodo - so you will dive with the real Komodo Experts! MOANA's experienced dive guides and Instructor dive these waters nearly every day, all year long. 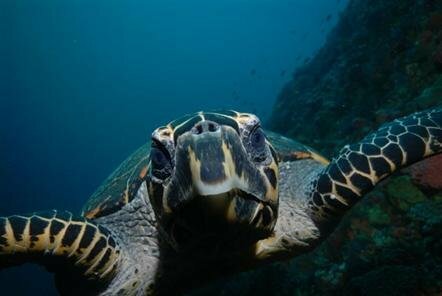 We know the dive sites, the currents and the marine life. Our passion and knowledge of the area will keep you amazed throughout your safari with us. MOANA’s well trained diving crew takes care of everything, from the equipment set up until the cleaning at the end of the trip. Equipment and scuba tanks are maintained and refilled at the diving platform at the stern of the boat. We dive from both of our speedboats, entry and re-entry are very comfortable thanks to the spacious staircase at MOANA’s back. Breakfast, lunch and dinner. Luxury cabin with air conditioning, private shower and toilet. Water, tea / coffee. Towels, snorkel equipment, land excursions, European cruise leader, transfer from or to the ship. flights, alcoholic drinks, soft drinks, tips (about € 10, - p.p.p.d. ), Complete diving equipment (€ 180, - per trip), Port dues & National Park entrance fees (€ 115, - pp payable in cash when you board) . Welcome aboard! The MOANA is waiting for you in the harbour of Labuan Bajo/Flores. After a refreshing welcome drink, the journey begins at ca. 10 o'clock in the morning. Now it’s time for a short introduction to the facilities of our vessel, the diving operation and the tour program. Check-out dive: 1 SABALON or SEBAYUR. 2 SEBAYUR for night dive. Enjoy your first dinner and night on the Moana. Small breakfast. Morning dive: 3 CRYSTAL ROCK. After second breakfast depart for dive nr. 4 CASTLE ROCK. The rock is packed with bronze and rust colored sponges and soft corals. You can see black snappers, large cuttlefish, pyramid butterfly fish, and red octopuses. Later in the afternoon we climb the local summit and enjoy a splendid panorama over the moon-shape islands of the Komodo Archipelago and the mainland of Flores. Afternoon dive at 5 LIGHT HOUSE in the north of Komodo. 6 GILI LAWA DARAT BAY as night dive. Day 3 starts again with a morning dive: 7 TATAWA KECIL. 11 o’clock dive: 8 TATAWA BESAR. Thousands of fish of every colour and shape are here including regal angelfish, checkerboard wrasse and masked unicorn fish, against a beautiful backdrop of acropora corals, gorgonian fans and sponges. In the afternoon we dive: 9 MOANA‘s MANTA POINT and 10 SIABA BESAR as night dive. This morning we dive at our favorite spot: 11 CURRENT CITY (Batu Bolong). While enjoying a wonderful breakfast, we sail towards Rinca, relax and enjoy great views, let our crew pampering you while spotting dolphins, reading or sun bathing. 12 PULAU TENGAH (Little Batu Bolong) our new secret hot spot! 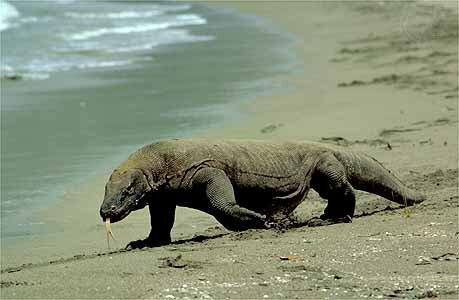 In the afternoon you are able to enjoy the 1 hour “Dragon walk” to see the last representatives of the Jurassic Park on earth, the infamous Komodo Dragon. During sunset we will be off the coast of Bat Island, where we will see thousands of flying foxes (megabats) fly to the mainland in search of food. On day 5 we will have breakfast together. Then, at about 10 o'clock, you will be transferred to the airport of Labuan Bajo where your plane to Bali is waiting for you.